This week, Donald Trump Jr. tweeted an image comparing Syrian refugees to a bowl of Skittles with three deadly pieces. 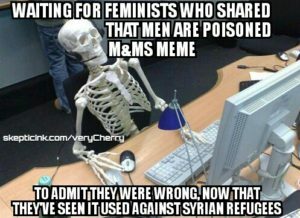 As I wrote about back in November, the poisoned food/Syrian refugees analogy is very similar to the one many feminists were making against men. After the 2014 Isla Vista shootings, the poisoned M&Ms/men analogy went viral. 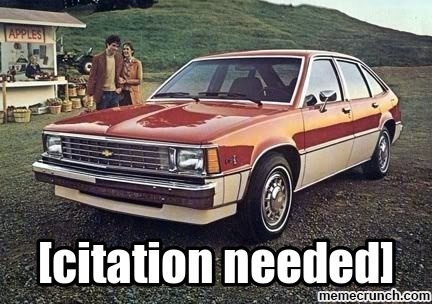 It was widely shared on Twitter, Tumblr, and Facebook in typed out words, or in various images, such as the one included in the collage here. Both are wrong. This is an example of the horseshoe theory in effect. 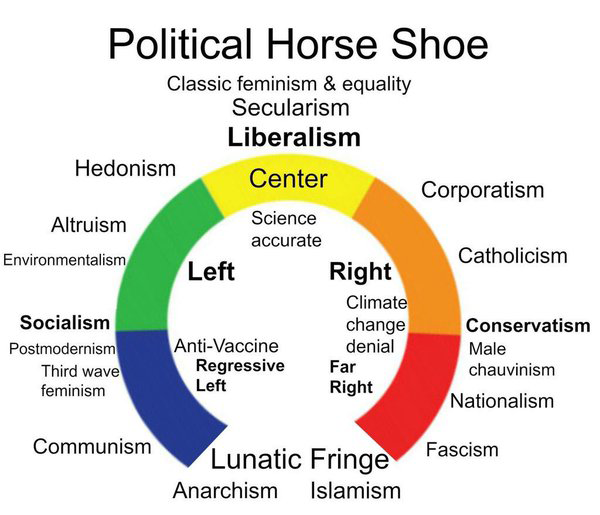 Instead of showing the linear left-right continuum that we’re most used to seeing, the horseshoe shows that the far left and far right are closer to each other in ideology than we may have realized. While the M&Ms meme was about dangerous men, and the Skittles analogy is about Syrian refugees, both use the same illogical thought process. Donald Trump Jr.’s tweet has been widely discussed and criticized on news and social media for the past several days now. 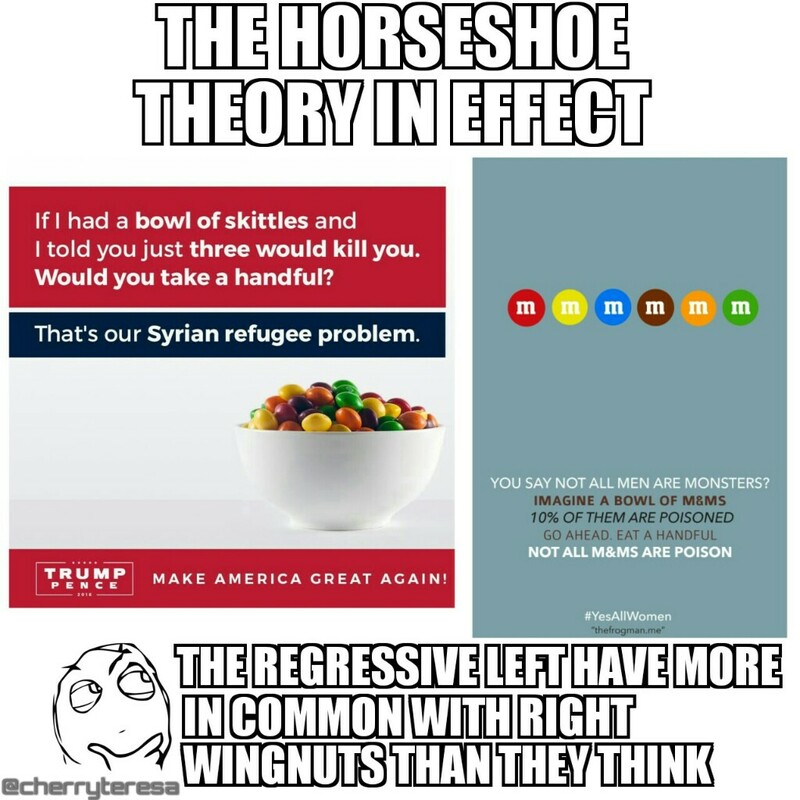 There is no doubt that many people who originally shared the M&Ms/men meme have seen the Skittles/Syrian refugees image with an official Trump/Pence logo on it. And most of them aren’t Trump supporters and they disagree with the message. There has to be some people who now realize they were wrong, whether they admit it to others or not. If you’re one of them, I encourage you to come out and admit it. It’s OK! I’ve been wrong about stuff before. We all have. If you read my blog posts or follow me on social media, I make no secret about that. 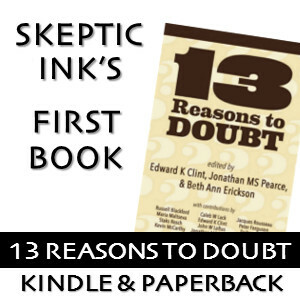 I share my learning experience and the reasons I believed what I did so that I can help others. And if it’s issues I’d spoken about publicly before, I want to make sure I correct that bad information, so I can let others know who saw it that it was incorrect. Waiting for feminists who shared that “Men are poisoned M&Ms” meme to admit they were wrong, now that they’ve seen it used against Syrian refugees. You are right on not holding your breath. I just read another article which call the original meme a ” slightly more apt comparison”. Do you have a link? I’d love to see that, if you remember where you saw it. I’m curious to know whether there is an underlying factual claim regarding 10% of men. If I wanted to draw out the implicit assumption in Trump Jr.’s Skittles meme, I’d say that it runs something like this: Approximately 3 out of 375 refugees are going to commit at least one act of terrorism if we allow them to immigrate here. This percentage is off by a several orders of magnitude, as I mentioned here. If I wanted to draw out the implicit assumption in the feminist M&M meme, well, I’m pretty much at a loss. Perhaps 10% of men are monsters in the sense discussed here. Who knows? Love your memes, btw. ??? This is a complete misuse of the word feminist! A feminist believes in equality between sexes, not man-hating.